The way public spaces are designed can have a big impact on the lives of women. This event features a panel of speakers who will discuss how public art and space can be designed to be more welcoming and accessible. Everyone there will be invited to be part of the discussion which will be drawn or 'graphically recorded' as we talk. Cnr Bell Street & St Georges Road, Preston VIC 3072. Register via eventbrite - we'd love to see you there! 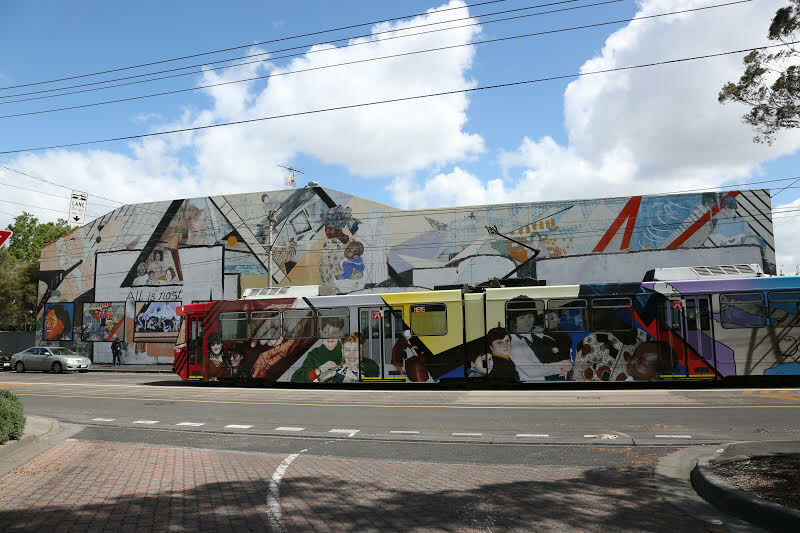 PHOTO: The Women's Mural, 'Bomboniere to Barbed Wire' in Fitzroy, painted by artists Eve Glenn & Megan Evans in 1986, is passed by a Number 86 tram with a copy of the Mural on it. Photography by Danielle Hakim. Through the year WDV works with communities around Victoria to run the Enabling Women leadership program. Two Enabling Women groups have just graduated, one in Melbourne's West and one in Melbourne's East. Stay tuned for updates on the Western graduation. Congratulations to all the women who participated. In the Inner East, nine women completed the program. Graduation was on the 24th November at MC Square Doncaster Rd Doncaster. All the women gave a brief speech to over 50 guests. The women received a standing ovation as they left the room for their graduation photo and their pride was palpable. All the women have identified goals that they have reached or that they are working on with their mentors. Thanks to the four Inner East councils for your partnership on this program, it was wonderful to work with the City of Whitehorse, City of Boroondara, City of Monash and the City of Manningham. Thanks too to the reference committee, the mentors and the Portland House Foundation for their valued support. WDV is currently advertising two positions to work with us. See details of the Executive Assistant role and the Program Assistant role on our employment page. These are both part time positions. Women with disabilities are encouraged to apply. The Australian Federation of Disability Organisations (AFDO) Disability Loop project is proud to announce that free NDIS workshops are coming to key regional areas in Victoria. Over three days from 14 December 2016, people with disability and their families in Ballarat will be able to get detailed information on the NDIS in a series of six half-day workshops. These workshops will also be available early next year in Bendigo, Horsham and Wodonga. I have my Plan, what now? People are welcome to register for some or all of the workshops. The State Government of Victoria and City of Melbourne are working in partnership to create a permanent memorial for victims and survivors of family violence. The memorial aims to provide a space for all members of the community to reflect and heal. They welcome your thoughts on the development of this important site. Consultation is open from 30 November until 19 December 2016, as part of the 2016 Victoria Against Violence campaign. For more information or if you would like the survey translated in another language, please contact the Department of Premier and Cabinet by emailing vav.2016@dpc.vic.gov.au.